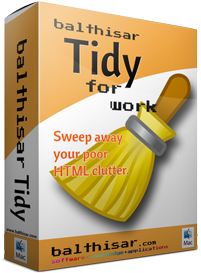 The professional version of Balthisar Tidy sweeps away your poor HTML clutter and includes the power of automation, color themes, and more! 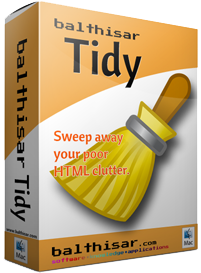 You use Balthisar Tidy to sweep away your poor HTML clutter. Current Version works on macOS 10.10 (Yosemite) through macOS 10.14 (Mojave). If you need support as early as macOS 10.8 (Mountain Lion), Tidy v2.2.1 is available. If you need support as early as macOS 10.4 (Tiger), Tidy v0.6 is available. If you need support as early as macOS 10.2 (Jaguar), Tidy v0.5 is available. Sample AppleScripts for use with Balthisar Tidy for Work. 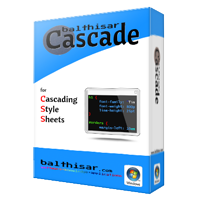 Balthisar Cascade cascading style sheet editor will make learning and producing CSS easy! Note: Cascade Application runs on all Windows platforms. The Cascade Installer in only for Windows XP and older. Some of the required files used in Balthisar’s Guide to Non-Supported Mac OS X Printing.